I haven’t been posting here that much, but I don’t want anyone to think I’ve dropped off the face of the Earth. I’ve just been keeping very busy with a few things. We had an emotional rollercoaster starting with Bar Mitzvah Incident. The next week, NHL had an outing with a friend of his. After seeing NHL sad because he was excluded, it was so wonderful to see him playing and having fun with a friend. They ate out at Puzzles bakery in Schenectady – which we love supporting because they’re a local business and they hire people on the Autism spectrum. I even let NHL get dessert – a half pound peanut butter and fudge brownie which we split. After eating, we all went to the Museum of Science and Innovation. It was wonderful seeing NHL having fun with a friend. The butterfly house was still out so we all went in it. Now, normally, NHL doesn’t like going in. He overemphasizes with the butterflies and winds up afraid that he’ll hurt them. This usually means we go in without him, but today he voluntarily went in. More than that, he was enthusiastic and loved seeing all the butterflies all around. He even went in a second time before we left. We’re definitely doing another get together soon. A few months ago, JSL told us that he was writing a book. This wasn’t a surprise since JSL loves making stories. Whether it is written stories, playing with his toys, or even with the magnets on the fridge, he’ll have whole storylines pouring out with heroes, villains, and epic battles. When he told us he was writing a book, had illustrated the cover, and was giving out signed photocopies of said cover, it sparked something in me. I decided to take up writing again. I have had two story ideas bouncing through my head for years. I chose one and mapped out a long tale – then quickly discarded it. I decided to start small and work on a short story instead. Also, I decided not to map the story out but to just write and see where it took me. (Though, sometimes this meant needing to go back and rewrite a section to make everything fit better.) My "short story" grew and grew. Before I knew it, I had 5,000 words written. Then 10,000. My most recent count puts me at almost 32,000 words and the story is only around halfway over. I figure that, when it ends, the tale will be 50,000 words long. This is in the "long novella/short novel" territory. It doesn’t end there. As I was fleshing out the world while writing this story, I realized that the tale would extend to multiple storylines. So when this story ends, I can start "Book 2" and expand it more. I also have built a world where I can tell side stories that don’t involve the main characters at all. Oh, and remember that whole "you need to be published to be a successful writer" thing that I believed as a college student? Well, I might have been wrong, but it so happens that it’s much easier to publish nowadays than it was twenty years ago. Back then, to get published, you needed to submit your work to publishing companies who would critique your writing and likely reject it. Now, I could publish it on my blog – giving it out for free. I could post an ePub file for everyone to download. I could even use CreateSpace to make an actual, physical book for people to buy. I’m planning on taking this last step. I’m under no illusion that this will sell like crazy (though I do allow myself the occasional fantasy where my book becomes the next "Harry Potter") but it will be satisfying to give someone a copy of my own book for them to read. Passover starts tonight. During December, I’ll sometimes laugh when my Christian friends talk about the pains of putting up all of their Christmas decorations. I’ll respond with the "pain" of decorating for Chanukah. "You take out the menorah and some candles. Done." Unfortunately, Passover is when Karma kicks in. Passover preparations begin weeks in advance as you buy special foods (that cost a lot of money) and try to use up all the foods you can’t eat during Passover. Yesterday, I started the main preparation of cleaning the kitchen. Counters were scrubbed, ovens were cleansed, refrigerator shelves were taken out and put under hot water and soap. Today, I need to finish cleaning everything and THEN I get to go to the attic and carry our heavy Passover pots, pans, and other various equipment down from our attic. Once that’s all done, I get to "relax." Normally, this is where I’d cook a huge meal, but we’re going to someone else’s Seder both nights so I get to take the night off from cooking. The downside? Dinner won’t start until after 10pm. Saturday and Sunday morning are definitely going to be sleep in kind of days. So if I don’t seem to be around much, don’t think I’ve deserted the online life to become a digital hermit. I’ve just been extremely busy. I do promise to stop by and write a post once a week or so, though, and will definitely post updates on my might-be-a-novel. 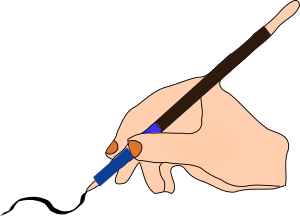 NOTE: The image above, "Write" is by Machovka and is available from OpenClipArt.org.